This flatbread has Friday night written all over it – it’s been a long week, you have people over and you don’t have the energy to do much. It’s easy to make, is delicious and makes you look like a superstar (You are so much better than frozen pizza!). For an even greater twist, try it on the barbeque! *I buy the pre-made PC Blue Menu ones and freeze them so I have them on-hand. In a small saucepan over medium heat, simmer figs with balsamic vinegar and water until figs have softened and mixture has thickened, about 10 mins. Place flatbread on baking sheet or pizza tray. 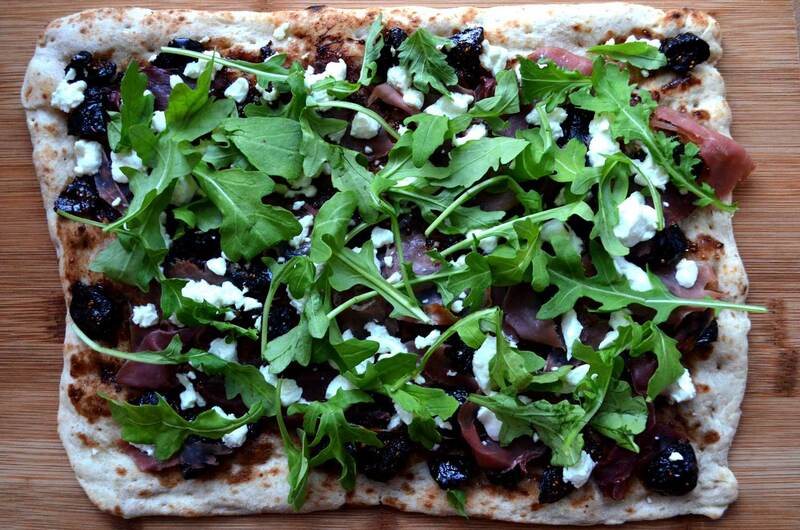 Spread a thin layer of fig spread over the flatbread and top with shredded slices of prosciutto, dispursed evenly. Crumble the goat cheese evenly over top. Bake for approximately 8 mins or until goat cheese has slightly softened and bottom of flatbread is slightly crisped. Remove from oven and let cool slightly. Top with arugula and serve.